Throughout August there was an undeniable buzz around the trending hashtag #backtoschool. This phrase resonates with so many in a wide age range, from young children in elementary school excited for a new backpack to college students budgeting money for textbooks. Upon analyzing #backtoschool in Sysomos MAP, we collected a wide range of data. As you’re able to observe, our word cloud is filled with promotional words such as “win”, “giveaway”, “prize” and “enter” which shows us that promotions by stores were a big part of the back to school season. One of the largest ‘words’ in the cloud besides “back to school” itself is “https”, drawing us to the conclusion that many of the tweets containing #backtoschool were serving as advertisements for products companies saw necessary for the approaching school year. In addition to these words and phrases, we also noticed words we had expected to like “backpack”, “lunch box” and “teachers”. 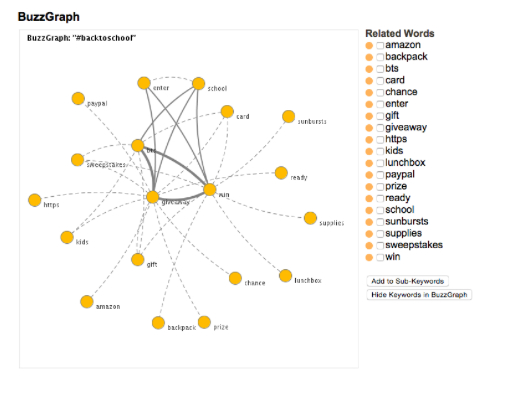 Similar to the word cloud, the buzz graph showed a similar array of words, also with a promotional nature. Some of the top results on the graph were, “sweepstakes”, “enter”, “giveaway”, “win”, “card”, “chance”, “paypal”, “gift”, and “prize”. The word “amazon” was also a popular result, and it’s probable that many of the links being shared out for #backtoschool were items from Amazon, thus explaining the top result of that word. Again, “https” made its way to one of the most buzz-worthy keywords. Among some of the more typical and expected words, much like the word cloud, we observed “backpack”, “supplies” and “lunch box”. The advertising voice behind many of the #backtoschool tweets is also present in the latest tweet from the August 1-August 31 date range as well as the most retweeted from @pinchme. The geographic distribution of tweets also caught our eye. We went into this exercise aware that #backtoschool is a bustling time in the United States and Canada, but we didn’t expect to see such a wide distribution around the U.K. Europe as well. After furthering our research to iron out the ‘whys’, we discovered that the U.K. and Europe begin their school years around the same time as North American schools. Because of the similarity of the academic calendars, the popularity of #backtoschool makes sense. Since the hashtag is in English and many of those countries speak different languages, we looked further to see that the distribution of #backtoschool tweets came from the U.K. and Poland, both of which have a large population of English speaking students and civilians.